BERT is a client/server hardware and software system developed to allow teachers of the blind to work with students at remote sites. Standard internet protocols are used to ensure maximum compatibility with various school internet traffic rules. The system has been designed with security in mind right from the start. Support is available online and by telephone. Cosmo is a classroom and student friendly Braille writer and Braille embosser. In combination these hardware and software devices are poised to transform the education of the blind. Using BERT hardware and software, teachers trained to use Braille can monitor a student’s work over the internet offering a real time side by side learning experience for both teacher and student. Most blind students are mainstreamed in to local schools near their homes where sighted students also attend classes. In many countries, teachers who specialize in teaching the blind students travel from home or the government agency where their office is located to remote schools where their students attend. Itinerant Braille teachers can now travel less and therefore be able to concentrate more of their time on individual students who are having difficulty learning. This will also make it possible for fewer teachers to work with a larger number of students. Government agencies responsible for teaching blind students would better utilize scarce funds currently being used for fuel and maintenance for their vehicles rather than direct educational deliverables. In areas where trained teachers who can teach Braille to children are not available or few in number, organizations or various agencies that do teach Braille would be able to offer remote education for these students. Many times a parent or teacher assistant would be able to be trained well enough about the BERT application and Braille writer to assist the remote educator. The BERT application is made to connect a teacher and a student, engaged in a braille and audio dialog over the internet. It can be used “live” as a classroom or “off-line” for assigned homework and responses. A teacher can create assignments or tests for a student who can respond when the teacher is not logged in. The teacher can be sighted, or can be blind. A blind teacher needs screen access tools to use the application. A screen reader hooked up to a refreshable braille device is recommended for a blind teacher. The BERT program presents itself to the student in a way that is intended to be as easy to learn as possible. During an interactive session, it is the teacher who controls the embossing. By pressing the “Read” key combination, a student can read the braille of what they just typed. The teacher can edit a line and re-emboss it, or enter an entirely new line to be embossed. BERT presents itself to the teacher with additional user interface that gives the teacher control of classroom sessions and the ability to initiate homework assignments. Typically an itinerant teacher may have ten students total and can see the presence of those who are using BERT at any given time. The teacher has the option of where to emboss Braille text, either at the student location or at the teacher location, mute the microphone or speakers, or access a blackboard where lessons can be posted or retrieved for individual students named on the total student list. New lessons posted on line by the teacher for a particular student can be embossed by the student. When the student completes the homework assignment using their Cosmo Braille Writer, the assignment will be automatically uploaded to that particular student’s folder in the teacher’s student directory. All students work will be saved until the teacher erases the assignment. The BERT Student Agent has a Session screen when the student is on line with the teacher. The session screen will display the Braille the student is inputting from the BERT Braille keyboard. 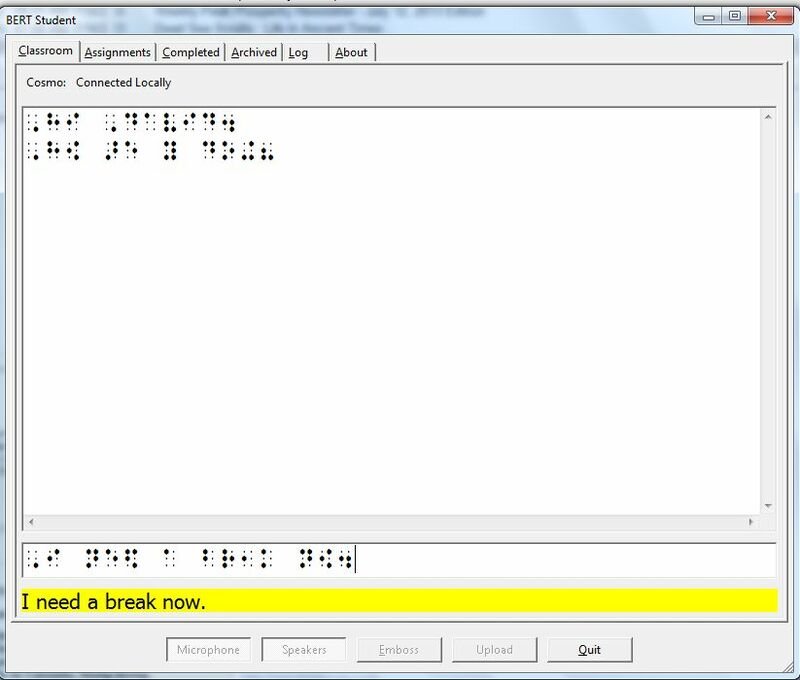 There is a highlighted Braille to text line at the bottom of the screen which typically shows a line of back translated text representing the current line of Braille the student is typing. Using this feature the teacher aid or parent can read along with the student. If the teacher is not on line or the student is not invited to a session a “Blackboard Screen” will appear instead of a Session Screen. The Blackboard screen will show assignments that the teacher posted, their current status, and a memo field for messages from the teacher. As with the Session Screen there is a highlighted translated text line at the bottom of the screen so that the teacher aid or parent can read along as the student is reading their assignment on paper or as the student inputs Braille to answer questions for their homework assignments given by the teacher. For older students who no longer receive help from a teacher aid, the BERT Student Agent is screen reader accessible so that the student can navigate the screen themselves. The application can also be controlled through keystrokes on the attached Cosmo unit; audio help is available at any time to list the Cosmo keystroke shortcuts for control of BERT. BERT for older students can be a way for blind students to succeed with higher mathematics or science they might see in secondary school or university. A teacher having the ability to instruct in real time as the student learns the math and science is extremely valuable. Cosmo hardware is essential at the student’s end. It is optional for the teacher. BERT software is required at each end. It is the same software for each end. The login you give determines what user interface is presented. The software is freely downloadable, but a subscription is required in order to login. BERT acts as if it were two separate applications, the “Teacher Agent” and the “Student Agent”. Both the teacher and student are able to communicate by voice and braille in real time during a teaching session. In March 2012, at last year’s C-SUN conference in balmy South California, eBrailler gave demonstrations of the BERT Student Agent. David Pillischer would invite people one by one to sit in a chair in front of a Cosmo unit, and don a headset to speak to their teacher. The teacher was Caryn Navy, who worked from her desk at Duxbury Systems in Massachusetts (and thus 2,500 miles from David Pillischer). Caryn is totally blind, and uses JAWS and a BrailleNote to have full access to the BERT Teacher Agent. “How is the weather out there?” The student asked. “We had a snowstorm and I almost did not get to work today” the teacher answered. “Could you please braille a line of text?” In a few seconds she said “you made two mistakes in your braille, would you like to fix them or would you like me to fix them”. The ability to work so intimately in braille and with speech across a continent without a hint of a time delay astonished those lucky enough to experience Cosmo and BERT that day. Cosmo is a Braille typewriter which is easy for children and adults to use, quiet, economical, easily maintained, and portable. 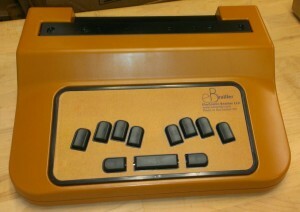 It can be used as a quiet Braille Embosser or a Braille input device for a computer when using the Duxbury Braille application. This means that a student can have Braille embossed in the class where other students are attending without disturbing the teacher or students. The Blind student can have the same hand-outs or information that the sighted students have at the same time. The blind student can use the Cosmo Braille writer without drawing attention to themselves because of unnecessary noise, they can be as anonymous in a classroom as a student taking notes with a pencil and paper. The Cosmo keyboard uses keys that have a living hinge similar to a piano’s keyboard. Because of the innovations in the design of the Keyboard there are no electronic parts or wires in the keyboard itself. A student can touch type with Cosmo instead of pound on the keyboard trying to insure good Braille. The keyboard fits in a depression in the top of the case which protects the Cosmo Brailler’s internal functions but allows the user access to the keyboard and the case under the keyboard. The key selection is detected by sensors located on the main circuit board which is under the outer case, and not accessible to the user. In this way the keyboard can be removed and cleaned by the user. The case of the device can be wiped off if there is a spill or if dirt or other debris accumulates in or under the keyboard. The keyboard itself can be cleaned with soap and water, then dried and replaced in the Cosmo Brailler. Cosmo used as a stand-alone Braille typewriter or as a computer input and output Braille device when used with the Duxbury Braille Translation application allows a teacher aid not familiar with Braille the ability to back translate the students Braille input to text, or read the back translated text while the student types using the current line translation option on the bottom of the Duxbury screen. The teacher aid can then monitor a student’s progress with little Braille training. The student can also input their document into the Duxbury application using Braille and when finished, back translate the Braille to text, and print the document to paper using a standard inkjet or laser printer. The blind student can submit their printed document to the teacher along with the rest of the class and have a Braille copy for themselves. When there is an assignment or class hand out, the document can be translated to Braille in real time using the Duxbury application. The document can then be embossed using the Cosmo emboss function in real time, in the classroom, without disturbing the other students. If a teacher or student were to use a standard Braille Embosser they would be unable to do this because of the noise levels produced. Noise levels are extremely high when embossing Braille on a solenoid based embossing mechanism similar to those found in almost all Braille embossers. The Duxbury Braille application is capable of producing math lessons and tests for a student. The Math would have to be produced by a qualified Braille teacher or transcriptionists. These lessons as well as other lesson documents would most likely be produced by the itinerant teacher and emailed to the teacher aid. The teacher aid would then input the document in to the Duxbury application at the student’s location, and then emboss the lesson document for the student. As the student advances and mathematics becomes more difficult, it is not easy to understand the algebra or trigonometry theorem unless the student can follow the flow of the mathematics application on paper. The above also applies to paragraph and sentence structure when working with an English assignment. Using the Cosmo and Duxbury combination any assignment or lesson can be embossed at the students location and the complex mathematics as well as the simpler lessons for the younger students can be processed and utilized in real time in the classroom or later at home. The student’s papers and assignments can then be emailed back to the itinerant teacher for grading. The student will be able to save their Braille homework and assignments on a computer the same way any other documents are saved when using text. Duxbury has over 130 languages already available. Cosmo is able to be an internationally used Braille device. Math codes, Braille tables, various Braille translation grades are already programmed in to the Duxbury application. Cosmo is a hardware device which would be able to utilize all of the features available in the Duxbury application.